The number 1 overall NBA draft pick in 2003 who won the NBA Rookie of the Year award and multiple MVP awards and finals MVP awards. His father figure was his youth football coach Frankie Walker, who took him into his home at the request of James' single mother. Walker taught him the importance of school and introduced him to basketball. LeBron and Kareem Abdul-Jabbar are the only players to win a pair of MVPs by the age of 25. In 2008, LeBron became the only player besides Oscar Robertson to average 27 points, six rebounds and six assists a game for four consecutive seasons. LeBron was the MVP of the 2008 All-Star Game. He scored 28 points with nine rebounds and nine assists in a 134–128 victory for the East. In 2008, LeBron recorded back-to-back triple-doubles. He was the first player to do this since Magic Johnson 20 years earlier. LeBron had a 50-point, 10-assist game against the New York Knicks in 2008. He joined Michael Jordan and Stephon Marbury as the only players to do this since the NBA-ABA merger in 1976. LeBron was NBA Player of the Month four times in 2008–09. The only other player to do that was Kevin Garnett. LeBron’s 594 free throws made in 2008–09 led the NBA. In a 2009-10 loss to the Denver Nuggets, LeBron became the first player since Oscar Robertson with 40 points, 15 assists and 13 rebounds in the same game. In 2009-10, LeBron became the youngest player to score 15,000 points, breaking Kobe Bryant’s record. LeBron was just the third player in history to leave his team the year after being named NBA MVP. The first two were Wilt Chamberlain and Moses Malone. LeBron garnered 85 first place votes to 24 for runner-up Kevin Durant in the 2012 NBA MVP balloting. LeBron was voted First Team All-NBA for the fifth straight year in 2012 and First Team All-Defensive for the fourth season in a row. In 2012 LeBron became the new spokesman for Dunkin’ Donuts and Baskin Robbins Ice Cream in Asia. LeBron and his girlfriend Savannah Brinson were engaged on New Year’s Eve 2011. President Barack Obama said on seven different occasions that he hoped LeBron would sign with his hometown Chicago Bulls. According to one estimate, losing LeBron cost the city of Cleveland $24 million. LeBron hosted a 2007 episode of NBC’s "Saturday Night Live." LeBron’s love of the Yankees resulted in the Bronx Bomber-inspired Air Zoom V LeBron. In 2008, LeBron became the first African-American man to appear on the cover of Vogue, a women’s fashion magazine. After LeBron’s reinstatement, courtside seats at the 2003 Prime Time Shoot Out in Trenton soared to as much as $1,000. LeBron carried a strong GPA at Saint Vincent-Saint Mary High School. His favorite subject was Earth Science. LeBron had a hand in designing the SVSM basketball uniform. LeBron’s favorite rapper is Jay-Z. LeBron shoots righthanded, but eats and writes with his left hand. LeBron is a huge fan of the Ohio State Buckeyes. LeBron loves cereal. Among his favorites are Fruity Pebbles, Frosted Flakes and Cinnamon Toast Crunch. LeBron spawned more than one cottage industry during his high school career. 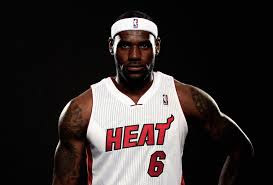 Known as King James, he has set many records for the Cavaliers and the Miami Heat. He and his high school sweetheart Savannah Brinson. had their first son, LeBron James Jr., on October 6, 2004. He is considered one of the greatest basketball players of all time and has won two Olympic gold medals with Kobe Bryant at the 2008 and 2012 Olympics.